When homeowners in Oklahoma City or Edmond contemplate a concrete construction project, there are many things to consider. Most homeowners that are looking at a concrete construction project around their home are thinking about a concrete driveway replacement, a new concrete patio, a sidewalk, or perhaps a new swimming pool deck. Why Use Concrete For Your Next Construction Project? Concrete is definitely the best material for any of these construction projects, but beyond the material used, what else should homeowners keep in mind? The professionals at Bill’s Custom Concrete believe you should consult with a true professional concrete contractor that can advise you in the nuances of a concrete construction project done right. Concrete is long lasting and easy to maintain making it a popular choice for homeowners. Beautiful concrete not only transforms the appearance of your home but also increases the property value. For new concrete construction as well as repairs, Bill’s Custom Concrete is the company you can rely on in Oklahoma City and Edmond. While we do service the entire Oklahoma City Metro area, the majority of our work is done in Oklahoma City and Edmond. For over four decades, we have been serving commercial and residential clients in Oklahoma City and Edmond. As a licensed and insured concrete contractor, we have built a strong reputation for excellence. This can be seen in our many online reviews in Google, the Better Business Bureau, Facebook, Yelp and other online directories. Our team of highly skilled concrete professionals use the latest construction materials, methods and equipment for every project we take on and only leave when the client is fully satisfied with the outcome. Satisfaction is our number one priority and we make sure that all of our customers are satisfied with their concrete project before we consider our job complete. What Makes Us Different From Other Concrete Construction Companies in Oklahoma City? We use only top grade concrete materials which ensures that our construction work lasts for years, if not decades. We offer the best warranty in Oklahoma City. We have an excellent reputation with the Better Business Bureau so you can be confident that you are dealing with a reliable and dependable concrete construction company. With over 40 years of experience, our knowledge in the industry is unmatched. We know the best way to do all concrete work as well as solve all yard drainage problems. We have a ton of references and testimonials which you can check out. Also, you can inspect most of our completed projects so that you can be certain that you are getting first class service. We are licensed to operate in Oklahoma City and Edmond so you will not have any problems with permits or code violations. We have workers compensation insurance to protect our clients for law suits in case of accidents as well as general liability insurance to protect your home and property from damage. 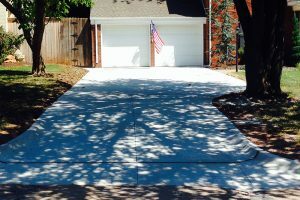 Our experience in dealing with custom concrete driveways is unmatched. We use the top grade cement to create concrete driveways as per engineering specifications and the client’s needs. We then reinforce the driveway with wire mesh to ensure that it can withstand the enormous pressure over the years. 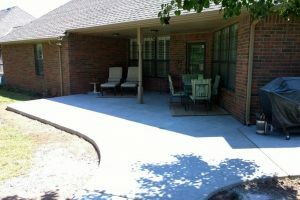 In the 40 plus years we have been in business, we have created millions of dollars’ worth of patio designs. Our experts pay attention to each client’s needs during consultation and provide a design that meets their expectations. Our skilled team has the ability to create customized patio designs with smooth finishes that will transform the entire look of the patio area, or we can use textured, patterned or stamped concrete to add a particular style for a decorative concrete patio. We create solid and unique sidewalks with or without patterns. We also ensure the sidewalk is strong by pouring 4 inches of concrete onto the base of sand. 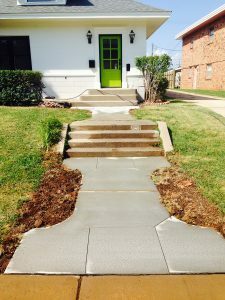 Your sidewalk will not only be visually appealing but will also add the value of your home. Call Bill’s Custom Concrete at (405)755-3975 for all your concrete construction needs. Whether you are considering a new concrete driveway, patio, sidewalk, swimming pool deck or some other concrete structure, Bill’s Custom Concrete has the experience and expertise to do the job right for you the first time with our satisfaction guarantee. We look forward to helping you with all your concrete needs. If you have a project in mind for your home or business, contact us today. We will answer any questions you may have and we do offer a free estimate.